Are you considering building a tiny house of your own? Do you want to learn how to build with SIPs (structural insulated panels?) If you are getting serious about building your tiny house this year, one of the very best things you can do is get some hands-on building experience. I'm going to be leading a week-long Tiny House Build Blitz in Tucson, AZ at the beginning of March to help a fabulous couple build their tiny dream home and we're excited to share this learning opportunity with you, too! If you're ready to roll up your sleeves and get to work, this workshop is for you! Sign up with a buddy and you both get $100 off when you sign up! Space is limited, so please register for the Build Blitz in Tucson to claim your spot today! 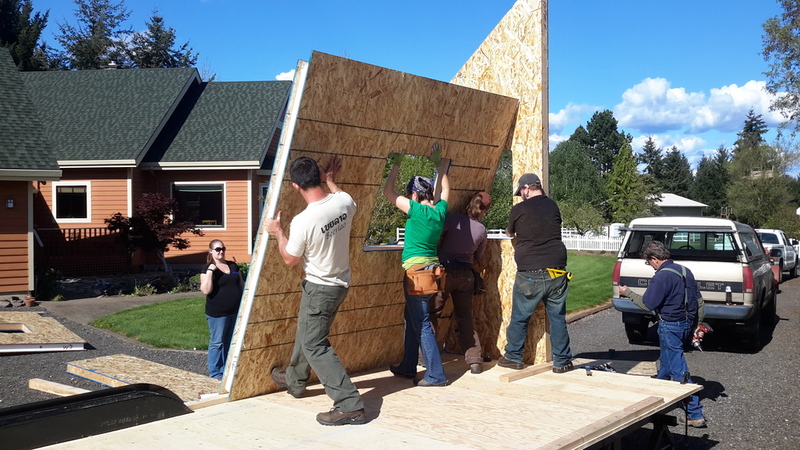 Hands-on experience building the shell of a tiny house on wheels using high-quality, energy-efficient building materials including SIPs and a liquid-applied water resistant barrier! Personalized instruction to use basic hand and power tools! Your very own tool belt with basic hand tools to take home with you! The satisfaction of helping an awesome couple start their tiny dream home! Lots of laughs, high fives, and an awesome sense of empowerment! This six-day workshop will run from 9AM to 5PM each day from Sunday, March 6 through Friday, March 11 in Tucson, AZ. Register for the Build Blitz in Tucson to claim your spot today!